PITTSFIELD -- On a quiet afternoon here, Bill Lashon is sweeping the aisles between the red velvet chairs in the 262-seat community movie theater. 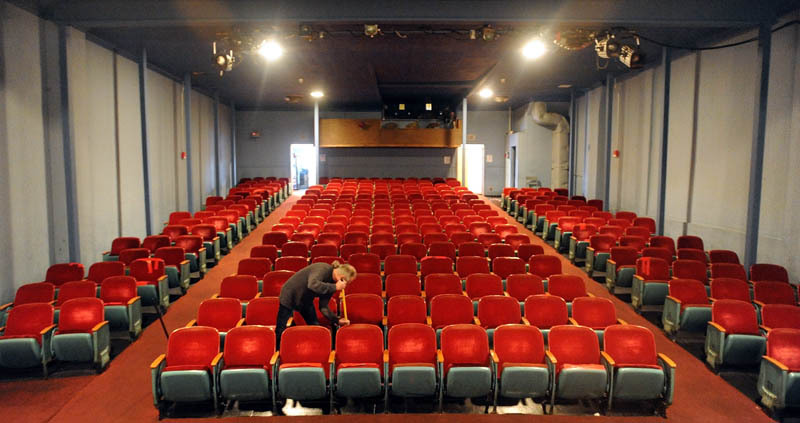 PITTSFIELD — On a quiet afternoon here, Bill Lashon is sweeping the aisles between the red velvet chairs in the 262-seat community movie theater. Upstairs in a dimly lit room overlooking the cinema, he nimbly splices together six rolls of 35 mm film comprising the movie “Argo,” which was shown last week on the single-screen stage. A self-taught projectionist, Lashon, 48, has gotten down the art of converting shipping reels into projection reels, a process that he says takes about an hour to an hour and a half and that must be done every week when the cinema gets a new movie. The reels the theater receives from film distributors usually contain 18 to 20 minutes of film and must be cut and spliced together into a single reel. Then they are fed through something called a platter and into the projector, which faces the white screen on the theater’s stage. About three-quarters of cinemas nationwide have converted from 35 mm film to digital projection because of film distributors’ decision to stop producing the 35 mm reels, according to Juliet Goodfriend, the executive director of the Bryn Mawr Film Institute in Bryn Mawr, Penn. “Among art house and community theaters, I’d say that number is more like one-third. Unfortunately, this can be a terrible challenge for smaller theaters, and there are many that won’t make it,” she said. Goodfriend said there’s no set date for when 35 mm film will become obsolete, but most major distributors have said they won’t produce it after the end of this year, she said. “Theaters really don’t have a choice if they want to show current films, because at some point those films won’t be produced on 35 mm reels. They are definitely going to need to convert,” said Shannon Haines, the Executive Director of the Maine Film Center in Waterville. Goodfriend said the cost of buying and installing a digital projector can range from $35,000 to $150,000 for a single screen, depending on the size of the screen and whether the theater needs to update other equipment, such as its sound system, to make it compatible with the new technology. For smaller theaters such as the Pittsfield Community Theater, which has been fundraising for the last five years to buy digital projection equipment along with completing other renovations to the theater, it can be a struggle. “I think its hard, and a lot of single-screen theaters in the state are already struggling to survive. We’re counting on the people in the town wanting the theater and being willing to keep us here,” Lashon said. At the Railroad Square Cinema in Waterville, which is owned by the Maine Film Center, Haines said the theater plans to convert all three of its screens to digital within the next few months, although it probably will keep the capacity to show 35 mm films on at least one screen, she said. Elsewhere in the area, the Strand Theater in Skowhegan plans to convert its three screens to digital projection in April, while the Narrow Gauge Cinema in Farmington has converted two of seven screens, according to John Moore, who owns both theaters. Moore said the advantages of digital film are mostly for distributors, who will save money on shipping and storage costs, although it might be easier to preserve the quality of film with the new technology. “No matter how good it is to start, the 35 mm film degrades over time and gets scratched. The beauty of digital is you don’t have that,” he said. For audiences, the conversion could explain a slight increase in admission costs, said Ken Eisen, film programmer at the Maine Film Center. Eisen said Railroad Square doesn’t plan to raise its admission prices to cover the cost of new digital equipment, but he understands why some theaters might. “They have to find a way to get back some of that money they are investing. It makes sense, especially for smaller theaters,” he said. Some people already might notice the cost associated with 3D movies, which are produced only digitally now, Eisen said. When it comes to watching movies, though, the differences are minimal and there’s no saying what people might prefer. Eisen said that digital film is to 35 mm what CDs are to vinyl records. Just as some people like the softer sound of vinyl, there are people who prefer the softer image found in 35 mm to a clean, crisp image produced digitally. “I think the average moviegoer wouldn’t really notice a difference, though,” Eisen said. There are differences, however, in how the systems operate that will affect projectionists and cinema owners, Haines said. “Digital systems are much more automated. It’s more of a drag-and-drop system on the computer,” she said. “It doesn’t require someone onsite to manage the system.” It’s also a difference between a hard drive weighing ounces and reels of film that weigh 50 to 75 pounds, Moore said. In the future, he thinks there will be more demand for information technology specialists in cinemas. “IT people are what we’ll really need now, someone who is familiar with software and networking. That’s the person we’ll be hiring in the future. 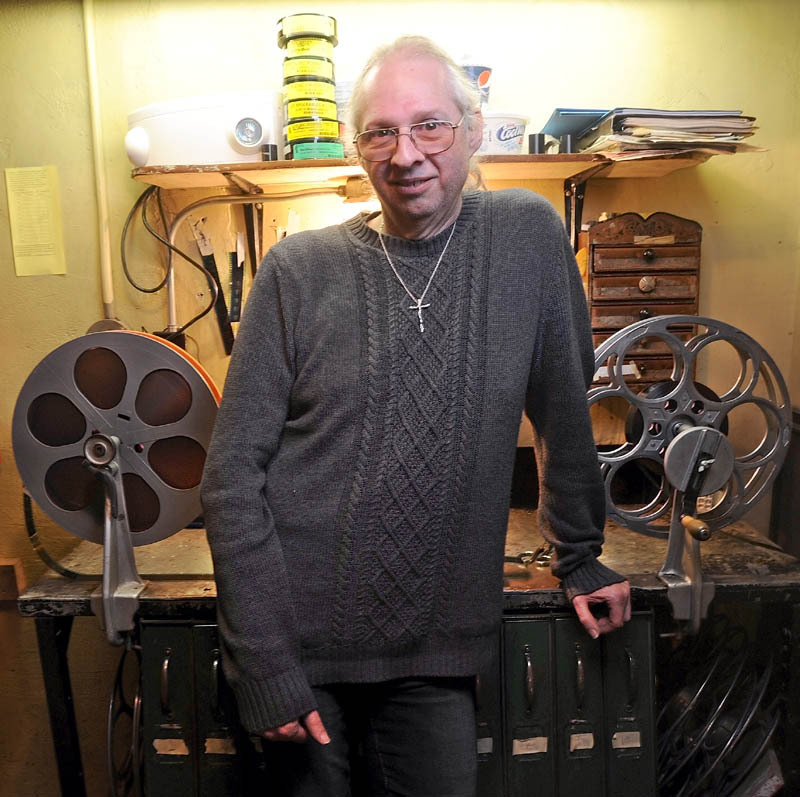 The traditional job of projectionist is much more mechanical,” he said. 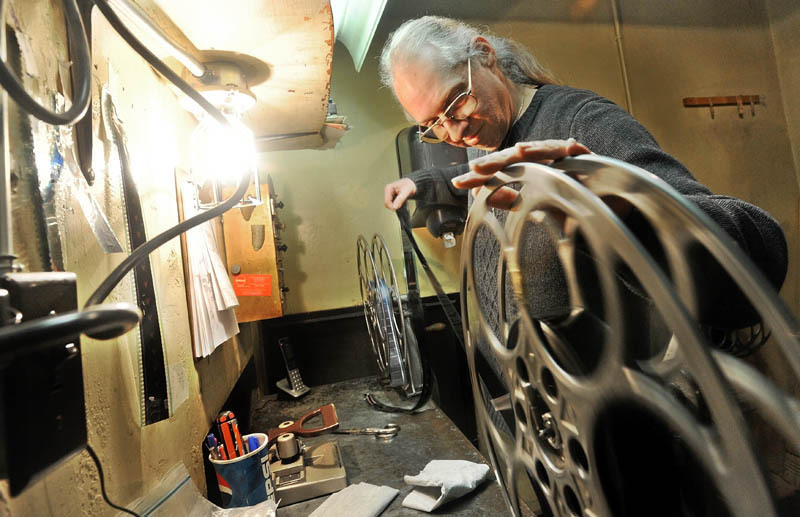 The Maine Film Center also recently installed a 35 mm projector at the Waterville Opera House before last year’s Maine International Film Festival. “Part of our long-term commitment is to 35 mm film. There will always be a need for a projection system to show classic films in the way they were formatted to be shown,” Haines said.